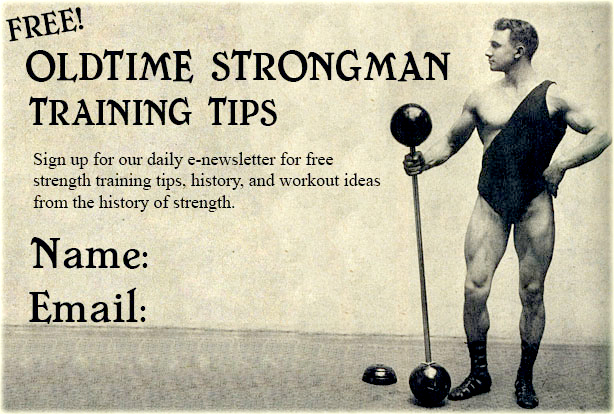 Now you too can learn about the life and training secrets of one of the strongest men to ever walk the Earth! Once a generation, a man comes along whose strength is simply head and shoulders above everyone else ~ and Hermann Goerner was just such a man! His strength and power was the stuff of legend, and even nearly a century after his time, no one has ever been close to many of his records. Goerner’s most famous lift is likely his ONE-HAND deadlift of 727 pounds(! ), but some of his other marks were equally impressive. These include a strict curl of 242 pounds, a deadlift of 505 pounds with just two fingers of each hand and a plank “leg press” with 24 people which totaled over two tons. Goerner had a “Challenge weight” a 2-3/8ths inch thick-handled globe barbell which he could clean and jerk with ease yet which no one else could so much as budge. How Did a Genuine Oldtime Strength Legend REALLY Train? Now you Can Find out for sure! A young Hermann Goerner with Heavyweight Champion Karl Swoboda, taken September 21, 1912 in Leipzig. Goerner was 21 years of age at the time. — How many days per week he trained, and the specific ‘type’ of workouts taken … How long each training session lasted … Goerner’s post-workout recovery … A typical training program … Details of the “Die Kette” kettlebell workout … Specific weights used and order of exercises … Lifting tempo … Training for special feats and records … Six different one-hand deadlift “grips” … Training for two-hands deadlifting … Three of Goerner’s favorite types of shrugging movements … Training for supporting or carrying feats … The Brick Lift … Pinch Lifting … Training for a match … Additional training information, diet, massage, roadwork etc. The modern reprint edition of “Goerner The Mighty” by Edgar Mueller is a 5″ x 7″ trade paperback, 136 pages in length and contains 32 rare photos and diagrams.